Once the oldest building at the Schatzalp it was rebuilt in 2008. The habitable surface of more than 220 sqm offers an exclusive accommodation for 6 persons with a wonderful view of the alpine surrounding. The interior is high levelled with two double-rooms and ensuite bathroom and one double-room with a bunk bed and private bathroom as well. 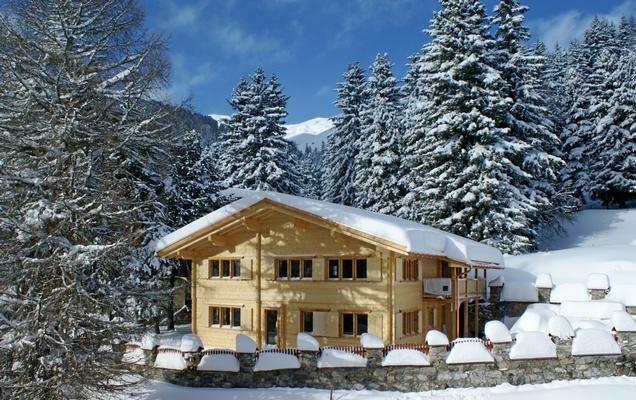 The kitchen and the living room are well furnished with modern entertainment equipments just like flat screens in each rooms, DVD entertainment system in the living room and free wireless LAN in the whole chalet. - Parking facilities: per object and day for rent at a price of 17 EUR (Mandatory). - Pet: per object and day Costs amounting to 13 EUR (Mandatory).